Socks. We all need em. I would LOVE to show you pictures of nice Japanese socks.....but I actually no longer have any because they worn out and had holes in them and I had to throw them away....and I seem to be suffering from another issue that many people have, the washer ate them. If you want to know where I personally shop for Japanese socks. Shinagawa station, Atre store, there is a place to buy socks and that is specifically where I always buy them. Now I don't have any Japanese socks to show you but I still got plenty of Tights. Tights in Japan are very common, its typical for a woman to wear tights instead of a full bear leg. We have lots of very very thin almost invisible tights that you can't even notice, girls love them because it makes their skin look nice. I no longer wear these for religious purposes, but I have plenty of non see through coloured ones. Japanese tights generally, in proper stores (like Marui (〇1〇1)) Will be arranged by THICKNESS. This is nice but the issue is, I feel tights in Canada, though generally made from cheaper looking material, have longer shelf life, cheaper in price and come in more thicker material. Price in Japan for tights, does not matter. ALL TIGHTS RIP, FAST! Those yellow Vivienne Westwood ones above, yeah they got a hole in them. From day 1. Next we have Happy socks. This is a Swedish brand that is found in a lot of department stores in Japan. 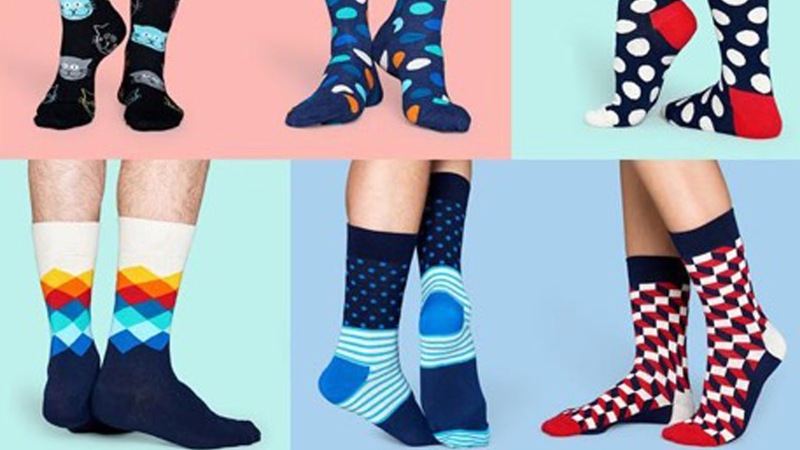 I think these socks are really good quality and come in fun colours. The happy socks I had lasted a long time. Last I want to talk about brand name socks, and where to get them. Now if you are thinking "but I want affordable socks!!!". Don't worry. Brand name socks, are actually around the same price, as regular socks. The socks I am wearing are Armani. Armani socks range from 10-25$, but mostly under 15. That is not a lot, as its the price for pretty much all socks I buy :/. Even though I only have Armani, I will tell you exactly where to get a lot of brand name socks in one place. Ikebukuro, Seibu department store. 5th floor mens department. Theres a corner on that floor for socks. My feet are size 23.5, but these socks are said to fit 25-27cm, but they fit me 100% perfect. Armani doesn't make ladies socks, but the mens socks will be fine for you ladies. This floor sells mens underwear and socks, all in same area (because its for suits, for workers). BUT MIRA!!! you LOVE Louis Vuitton! don't cheat!!! Lol. Don't worry. If Louis Vuitton made socks, I would be the first in line to buy them.